Glenn Abastillas (USA 2014) Creator of Tapni. Mnival valun sbanir fuparsar. Artemis Allaire (USA 2018) I'm a fantasy writer and a linguistics major who has been conlanging since 2009. I'm currently working on my Bachelor of Arts in Linguistics and plan to complete my Master of Arts in Linguistics as well. I hope to teach English as a second language until completing my MA. My favorite linguistic topics are phonetics, phonology, morphology, and syntax. Joel Anderson (USA 2015) Joel Anderson, despite rumors to the contrary, is not a Klingon. He is however: 1) A Software Engineer who has worked in software development and the telecommunications industry for over 20 years. He still remembers the "good old days" when computing online meant dialing with a rotary phone, using his VIC 20. 2) A science fiction enthusiast, Joel may occasionally need to be reminded that he is a human, from Earth. 3) A language hobbyist who enjoys building programs that use science fiction languages, especially those found in the worlds of Star Trek. 4) A card carrying member of the Klingon Language Institute. See his article in the institute's journal, HolQeD, "Building a Klingon Computer". Anthony Aristar (USA 2012) Retired professor of Linguistics. Founder of LINGUIST List. Focus: historical linguistics and endangered languages. Building complete worlds using GIS. Carl Avlund (Denmark 2018) I am a student from the island of Sjælland [ˈɕɛlaˀn]. My main interest is historical linguistics, and in my conlanging I like to work on ancient Stone Age languages and the conworlds and concultures that surround them. Doug Ball (USA 2009) Inventor of Skerre. Professor at Truman State University in Kirksville, Missouri. Justin Biggi (Italy 2017) Justin is currently working on expanding High Speech, the constructed language present in Stephen King's "The Dark Tower" series. When not conlanging, he writes a lot about the self-identification of 5th Century BCE Athenian citizens through language, the use of metaphor and sight in Plato, and the use of metaphor in Saint Augustine. Billy J. B. (Sweden 2012) Founder and administrator of the MediaWiki-based conlang site Linguifex ( http://linguifex.com ) and one of the Facebook-based conlang groups ( http://facebook.com/groups/constructedlanguages/ ). I am þe creator of several Indo-European conlang sketches (Germanic, Italic, own) and a few odd fraglangs. Pete Bleackley (UK 2015) Creator of Khangaþyagon and iljena. Local host of LCC6. Associate Editor of Speculative Grammarian. Francesco Bravin (Italy 2013) creator of the Danan language, a fictional ancient indo-european language. Jeffrey Brown (USA 2009) τεμεηια - The Temenia project is a model of the process by which an international auxiliary language is constructed, as well as an example language constructed by that process. Temenia had its first speakers conference in 2011. You can view the conference website here. Sally Caves (USA 2008) Conlang: Teonaht. Niffodyr tweluenrem lis teuim an. "The gods have retractable claws." I have worked on this language and its culture for about fifty years. The extensive webpages with drawings and samples of my script vanished when I abandoned GoDaddy, and will be restored on WordPress when I learn how to navigate it (help would be most welcome!). Teonaht is largely an a priori language with some lexical borrowings as its inhabitants mingle, clandestinely, with our own, but they remain largely isolated, and ever so slightly inhuman. I'm finishing a long novel devoted to them. Teonaht has some peculiar features, notably its OSV structure in formal writing and speaking (SOV in vernacular speech), and prefixing tense and aspect information on pronouns instead of the verbs. It makes a morphological distinction between volitional and non-volitional action and a large set of irregular nouns borrowed from a dead language, Nenddeyly. In the meantime I can direct you to the translation made by my ammanuensis, Issytra, of a Conlang Relay text she felt was utterly baffling: http://conlang.org/language-creation-conference/lcc5/3-teonaht/. My early machinima (or Real Time Animation--made under the sobriquet "Textcavation" and director "Hypatia Pickens") has me singing in Teonaht. Carmine Ceraolo (Italy 2018) First of all, I'm into science. I'm a full-time genomics student with a growing passion for conlanging. I have been working (sporadically, it might be) to my own natlang for two years, and I'll probably keep doing so for many years to come. I also love Na'vi and Toki Pona. Martin Edwardes (UK 2016) Creator of Pravic for Night School on Anarres project. Also interested in cants and cryptic languages, esp. Polari. Teaches language creation module at King's College London, and looking to start after-school conlang club project at local schools. E M Epps (USA 2010) Author of The Interpreter's Tale, a fantasy novel about a military interpreter on a diplomatic mission. Fenhl (Germany 2011) Mostly interested in collaborative conlangs (colllangs). Creator of Batu and Wanya; co-creator of Wyunurisi, Naeso, Jayus, and Ęndehl; and member of the Viossa project. Romain Filstroff (Austria 2014) Conlanger since I'm 12, I'm currently studying at the university of Vienna (indo-european studies & diachronic linguistics). I'm very interrested in the finno-uralic languages and the indo-european languages, especially the germanic and romance ones. And, of course, conlangs. ALL OF THEM. Greg Foster (Australia 2019) As a student of ancient history, I have developed sets of languages derived from many cultures. My language projects seek to implement languages based on societies both primitive and advanced with advanced grammatical concepts. Jay Goldstuck (South Africa 2018) I am an avid linguist with a passion for creating languages for fiction - specifically for film. Christophe Grandsire-Koevoets (Netherlands 2011) Christophe is the creator of Moten and Narbonese. Also, his is the crazy mind that invented Maggel. Aidan Grey (USA 2009) Gay, married, bearded, right-handed conlanger/six-cats owner in Aurora, Co, conlanging since 1983. Main project is Táálen, but was responsible for the mostly defunct Ardalang project (one of Muke Tever's lands is the last existent lang, I believe) and an ongoing series of practice sentences maaaaany years ago. Veronica Hamilton (USA 2010) Initial creator of the Brooding language, author of Unwritten: Adventures in the Ages of MYST and Beyond, and general creator of imaginative ephemera. Connor Hanzsek-Brill (USA 2018) Community organizer of the Dothraki speaking community online. Admin of the discord server, moderator of the subreddit and of the wiki. Tony Harris (USA 2012) Tony's most important language is Alurhsa, with Tariatta as a secondary and a number of others as yet only minimally developed. Jan Havliš (Czech Republic 2011) Jan's language creations are summarized here, under the green triangle window of the tower temple. Some pages of the individual languages might be slightly out-of-date, but still give relevant info. Joppe Heming (the Netherlands 2019) Author and language creator based in the Netherlands. Alexis Huchelmann (France 2015) Staff member of l'Atelier Philologique (the french conlanging forum), author of a master thesis on constructed languages "Les langues construites : délimitation, historique et typologie suivies d’une illustration du processus de création d’une langue naturaliste nommée « tüchte »" (on Academia.edu). Alex Igbineweka (USA 2017) Guosa is a Nigerian and West African common indigenous future lingua franca for unity, identity, political stability, tourism, arts, culture and science. There are about 400 different ethnic languages, dialects in Nigeria and about twice this number in other West African nations. presently, Guosa consists of more than 120 of these diverse tongues and it all started with two language interlarding in the beginning about 1964. The language is evolution of scientifically detailed units of traditional African words from different languages and cultures, so that in the future, the West African nations or ECOWAS should take their positive stand in the communities of world lingua franca nations such as the East Africa, North Africa, France, etc. Kamiki Itachi (Japan 2019) Assistant to Karen Traviss for creating Mando’a. Wilco Jacobs (Netherlands 2015) A dutch conlanger, making mostly conlangs inspired by altaic and tibeto-sinoic languages. Jacqueline (Italy 2017) I am studying Chinese and Japanese and I love creating languages. If anyone knows Tibetan, email me! David Johnson (UK 2010) David is the creator of the Lemohai, Õtari and Classical Leheitak languages. BenJamin P. Johnson (USA 2014) Germanicist, former IT Professional, beer brewer, mead-maker, cheese-maker, fountain pen enthusiast. Major personal conlangs include Northeadish (Druðþþᵫ̄ðeſc / Druþýðesk - Germanic a posteriori), Maltcégj (a priori), Valthungian (Grējutungiška Rasta or Sō Grējuga Tunga - East Germanic a posteriori with Latin influence), and Dlatci (a priori). Current developer and curator of the Brooding language (a priori), originally created by Veronica Hamilton and Ryan Long for the Riddlesbrood Touring Theatre Company, and creator of the Grayis language (a priori) for Infinite Mind Pictures, Inc.
Jeffrey S. Jones (USA 2010) I have worked on 'Yemls, K'tlê, Jaguar, and probably hundreds of small partial sketches. Victor Lancaster (UK 2018) I started making a new alphabet spontaneously just for fun. This has now developed into me huddling up by myself at any given opportunity to scribble away in a rapidly falling apart pad of paper to make a language nobody but me can understand (called ɒǀdɛːd (using IPA because I cant write in my own script)). I hope to find other people who share this extremely niche interest to distract me from the fact that I should probably be focusing on my GCSEs instead of creating an imaginary world. Anne Lyle (UK 2017) Writer, web developer and all-round geek. Author of Elizabethan fantasy novels "The Alchemist of Souls", "The Merchant of Dreams" and "The Prince of Lies", which feature two non-human conlangs. Piermaria Maraziti (Italy 2012) Has been conlanging since he can remember. Lorenzo Masci (Italy 2018) I've been passionate about linguistics since i can remember, and i started trying to create languages since 2014ish. I made a few highly developed conlangs and thousands of sketches. Oliver Mayeux (UK 2016) PhD Candidate, Department of Theoretical and Applied Linguistics, University of Cambridge. Jacob Menschel (Germany 2019) Creator of the Hatk'amman language family which currently only consists of one conlang, Old Ataman. Lives in south-western Germany. Jan Michalsky (Germany 2016) PhD in Linguistics (Experimental Phonetics). Teaching constructed languages as a University course at the University of Oldenburg, Germany. Sentaro Mizuta 水田 扇太郎 (Japan 2009) NOXILO (pronounced noshilo) is multimode language (SVO / SOV reversible and SVO / SOV / VSO triversible by the end of this year), and all Int'l Standard Words (ISW) has root on the wordhead. You can replace ISW with English, French, German, Russian, Chinese, Japanese, or any other natural language. William W Moore (USA 2017) I set out in 1957 to invent a universal language from scratch. I was seeking a logical or rational language, like math, that was not just a collection of arbitrary sounds, which would mean the same in every culture regardless of what other languages they already speak. In the process of "creating" language I discovered that the languages we already have are more "created" languages – products of forethought and design – and less products of "evolution" than they're commonly presumed to be. I'm still working at it. Julie Munsell (USA 2019) Creator of several conlang sketches and full conlangs for others in both a priori and a posteriori styles. In school, took many years of Honors English plus two years of Russian, and I have independently studied Esperanto and Latin American Spanish. I also create conscripts. Robert Marshall Murphy 武明帥 (USA 2013) Large project of Austronesian Hebrew at danayo.conlang.org. Other projects at linguifex.com/wiki/User:Aquatiki. Spencer O'Dowd (USA 2016) A conlanger with an unhealthy fixation on the way languages change over time, I specialise in the creation of language offshoots and dialects, whether they be real world languages or conlangs. Dan Parson (USA 2017) Founder of Sidosi, advancing and promoting Solresol (the universal musical language) since 2011. Also, web developer, computer technician, musician, and barefooter. Matt Pearson (USA 2010) Matt is the creator of the Okuna language (formerly Tokana), and also the creator of the Thhtmaa language, which he created for the television series Dark Skies. Rasmus Praestholm (USA 2016) Terasology lead - open source video game project with voxel world and more! Margaret Ransdell-Green (USA 2017) I am a graduate student in linguistics (documentary linguistics) at the University of Hawai'i at Mānoa (Honolulu, HI) and I've been conlanging since 1998. Scott Scharlach (USA 2017) Student at Pomona College in California. Creator of the Satsi language and the language sketches Xendareth, Qoazhau, and Nuzabiga. Marcus Shiu 徐轶 (China 2012) Creator of the Akul language. David Sicé (France 2018) I have a law degree and teach French as a foreign language, piano and singing. I am the author of role-playing table gamesshort stories, novels and essays in Science Fiction, Fantasy and Fantasy, as well as the textbook L'art du Récit (The Art of Storytelling) devoted to writing all media, linear and interactive. I have just completed the Stellar language, which allows, among other things, to import any lexical word from a foreign language to start speaking and writing immediately, using only 280 elementary words and affixes. 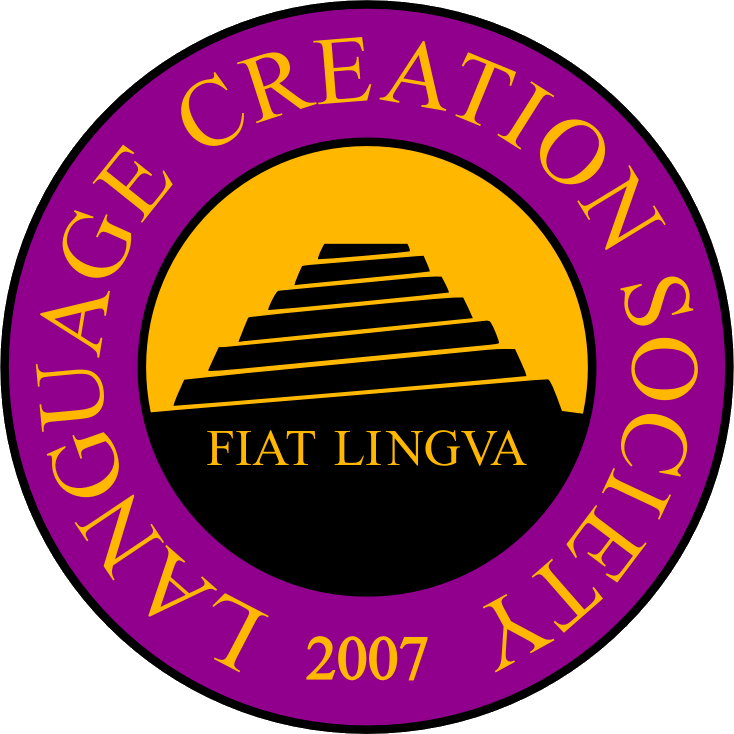 I have been a member of the L'Atelier de Création linguistique et de mondes imaginaires (Linguistic and imaginary worlds workshop) for ten years now, a French on-line forum. I also run a blog about SF. Isaac Silbert (Australia 2018) I have dabbled in the art of conlanging for many years now although I myself can't quite remember when I first got into conlanging. Many of my brief sketches have included quite rare typological features in an attempt to better understand them. Currently an undergraduate in engineering and mathematics, but I always have time for conlanging. Beverly Skinner (Canada 2017) I enjoy conlanging and world building for my aspiring fiction novel. My conlangs include Sarudani, Dankonish, and Eldtyric, in which I particularly enjoy designing and using new writing systems. Rodrigo Solano (Brazil 2012) Allamej is a hybrid language, resulting from mixing several world languages. It aims a semiotic reflexion on what segregates humanity. Sylvia Sotomayor (USA 2009) Creator of Kēlen: a verbless language. Tim Stoffel (USA 2011) My languages of most interest are: Na'vi, Dothraki, Klingon and Lojban. Moaaz TC (Sweden 2018) Teen who's really interested in conlanging. Originally from Egypt but lives in Sweden. Bethany Toma (Germany 2018) Moderator of /r/conlangs on reddit and of the conlanging Stack Exchange. Semantics and pragmatics are my jam. Antun Vlašić (Croatia 2018) Xarevas Azyk - Charewas Language|Am author of Xarevas, semi-Slavic arfificial language made from elements of Indo-Aryan/Indo-Eurpean languages, with many constructed elements based after my own ideas not into any existing natural human language. Lee Walter (USA 2014) Current work is centered around the Anyuvin language (aka Varindjo) and the development of software to support conlang development. Michael Weber (Austria 2012) Creator of Lemizh. Carla Weigel (Canada 2018) My name is Carla Weigel. I have a degree in Honours Linguistics and have been working as a Speech Pathologist Assistant since 2012. I have a great ear for accents and pronunciation and I really enjoy teaching. I am very creative and have done lots of creative activities in my past jobs and experiences. I know several languages from different subfamilies (or at least the basics!) and am able to identify and re-create the tongue positions of sounds that make a language unique. Sophia Willowood (USA 2017) Academically trained as a philosopher. Sadly, an accountant for money. Trekkie for life! Interested in philosophical languages as well as creating languages for the micronation movement. My own language, Sturanitian, was created for an in-progress micronation project for example. Irene Yi (USA 2019) Irene is an undergraduate student at the University of California, Berkeley studying Linguistics.